Last week, the TransitHub Team was honoured to have had the chance to chat with Andrea Wahbe (@TheRunningStart), a marketing consultant and Techvibes.com contributor, about our #TransitHubbing journey so far. 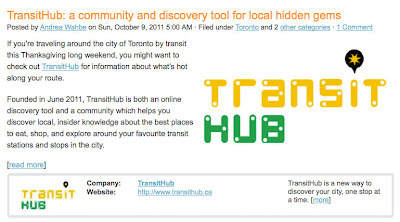 The piece on TransitHub was featured on Techvibes.com this past weekend and really captured our passion and enthusiasm for what TransitHub is all about: the community and our city. Check it out!